This is an update on this new BJJ competition that we covered last week. The 4 teams with the most votes in the poll win's a spot! NZGrappler powered by EHPlabs !!! 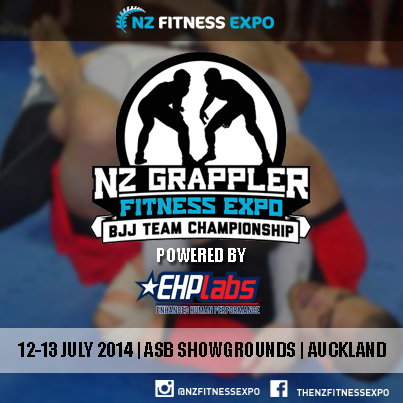 Get ready to witness the best Brazilian Jiu Jitsu athletes in New Zealand as they take to the mat over 2 days of BJJ action in the inaugural NZ Grappler BJJ Team Championship - Powered by EHP Labs!! Consisting of a GI Tournament (Saturday) & No GI Tournament (Sunday), 4 Teams will enter their best athletes across 4 Belts & 2 Weight Divisions to compete for the 2014 Championship Titles! Comment below to register your team ... we will then create a poll and the public will vote for who they want to see compete for 2014 Championship Title! EHPlabs have come on board and are sponsoring some wicked prizes, and every competitor will get something! But the biggest prize of all? Bragging rights .... REGISTER YOUR TEAM NOW if you think your the best in NZ! NZ Fitness Expo | 12-13 July 2014 | ASB Showgrounds | Auckland"